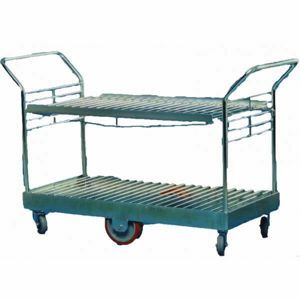 Fitted with 200mm fixed centre wheels and 100mm swivel castors to each corner (with this design there is slight light rock from end to end built into the trolley to ensure that the centre wheels are always in contact with the ground). This provides a low push effort and good carrying capacity due to the large centre wheels as well as excellent manoeuvrability because of the swivel castors. 12 Month Back to Base Warranty across all our depots - Sydney, Melbourne, Perth and Brisbane.